Your warehouse may also be a distribution center. Several warehouses simultaneously run as storage as well as distribution centers. Since product movement can be quick, it is important to have a consistent flow of inventory in order to meet demands. 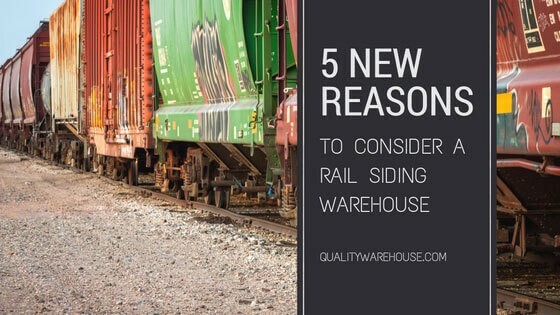 Rail lines not only offers direct delivery to your warehouse but there is also the added benefit of receiving large quantities of product at once. Basically, your shelves will remain stocked in order to ensure that your customer demands are met. Safer transportation of goods. Receiving quality product is a huge concern for most warehouses. Although it is inevitable that some items may be damaged during shipment, it is important that these numbers stay as low as possible. Delivering by truck runs the risk of accidents or “stop and go” traffic damaging more product than necessary. Since rail lines move faster with less stops and offer spacious storage areas, items are far less likely to be damaged during transport. If you are concerned about receiving damaged product, then rail lining may be your best option. Storage requirements. Frigid storage requirements are becoming increasingly normal. Due to potential lawsuits, safety concerns, or the desire to be proactive in order to ensure quality, several industries have normalized the way that items should be stored and shipped. Rail lines are especially beneficial when it comes to shipping items with special storage requirements. Although there are rail lines that do not offer this service, most rail lines such as BNSF Railways will provide a list of common items with special storage requirements that they have handled in the past. Customers are more cost-conscious. Although cost isn’t always an important item on a customer’s mind, the truth of the matter is that most consider this a driving factor when making a decision. A 2014 US Consumer Sentiment Survey states that 55% of consumers continually search for ways to make money. While this is not shocking, considering the decline in spending since the crash of 2008, it is certainly something to consider regardless of what sort of business you run. Rail siding is an excellent way to communicate savings to customers. Since rail siding costs much less than transporting goods via truck, these savings are evident in the final shipping costs that will eventually make their way onto your customer’s invoice. 5. It is an environmentally conscious move. Recently, more and more companies are thinking about the future and “going green.” Not only does rail siding offer shipment savings and the convenience of having items delivered at your doorstep, since rail cars can fit more inventory, it saves on fuel. In fact, according to the Washington Post, trains are substantially more energy efficient than trucks and much more efficient.